It’s still Thursday already Friday somewhere in the world! Thank God. I may or may not have been blasting some Rebecca Black as I started a new page for this post. One of the best parts of having an entire two-room bedroom apartment to yourself is that anything goes the moment your pinky toe crosses that blessed threshold. Rocking out to One Direction and Carly Rae Jepsen into the weest of the wee hours? Of course. Staying up all night at Disney movie marathon sleepovers that would make fifth-grade girls emerald with envy? Uh, yeah. Dunking your entire hand into the bowl of cake batter instead of reaching for a mixing spoon because it’s in a drawer that’s ten whole feet away from you? Now we’re talking, my friend. Lounging on your couch like a boss on a Thursday night in nothing but what your momma gave you and with a glass of pinot noir in your well-manicured hand? Of course, by the time I’m finished with this kamikaze quarter of teaching, coursework, and having a social life the size of a pea, I may just throw in (or rather, away) the towel, grab my fig leaves, and start lounging to my heart’s content. With my pinot noir. For which I will accordingly acquire a refined taste that I currently don’t possess. As with most things that don’t involve legal persecution or intense self-reevaluation of my worth as a human being, I grossly exaggerate here. My social life has actually been moving along quite swimmingly as of late, thank you very much. They might be watching reading. By “they,” I mean the incredibly attractive young men working as incredibly successful entrepreneurs at an incredibly well-established corporation that still manages to hang onto its good ol’ homey American values. You know, the ones currently residing in…my head. Or Storybrook, to be more precise. Yeah, I’ve started watching Once Upon a Time. …that my life has been summarily sucked up by it. We whipped up a batch of these for one of the guys in our department celebrating his birthday this week. If you like a) the idea of a steaming mug of hot chocolate dipped into your morning wake-up call with a hint of autumnal flair, or b) being awesome, you need to try these cupcakes. Preheat oven to 350 degrees F. In a medium bowl, pour hot water over cocoa and whisk until smooth. Allow to cool. In a large bowl, cream together butter and sugar until light and fluffy. Beat in eggs one at a time, then add vanilla. In a separate bowl, combine flour, baking soda, baking powder, and salt, then add to wet ingredients alternately with cooled cocoa liquid. Mix until all ingredients are all just incorporated and smooth; your mixture will be relatively thin, and this is perfect! To make cheesecake mix: In a medium bowl, beat cream cheese and sugar until creamy and smooth. Add egg, vanilla, and cinnamon; mix until well-incorporated. Set aside. 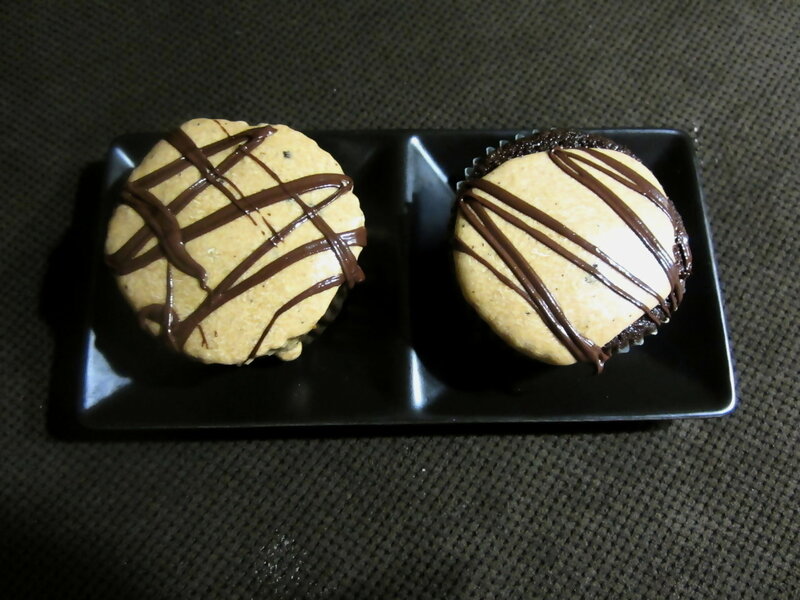 Place cupcake liners in a muffin tin and fill each liner about 1/3 of the way with batter. Carefully pour a small teaspoonful of cheesecake batter in (recipe below). Pour additional cupcake batter on top until the liner is 2/3 full; the easiest way to make sure your cheesecake batter doesn’t leak is if you pour the cupcake batter over it in one smooth sweep. (A slow pour will give the cheesecake time to ooze outwards.) Bake in preheated oven for 14-17 minutes, until a toothpick inserted in comes out clean. Allow to cool before frosting with coffee cinnamon frosting. Note: If you want to add a nice chocolate drizzle to your cupcakes, simply melt 1/2 cup semi-sweet chocolate with 1 tablespoon butter on the stovetop on medium-low heat. Make sure you watch your chocolate carefully and stir frequently to keep it from burning! Chocolate, coffee and cinnamon? What a perfect combination of flavor. And oh yeah…it’s wonderful to have the whole apartment all to yourself! I can never get any quiet time at my house…hahaha. Oh gosh, I can only imagine what it’s like having the kids running around! Maybe you can get them to calm down for a sec with this great combo of chocoffeeamon? Fun writing – almost free verse. (OK, not really but with a bit of effort it could be there.) If your lease allows it, one of those chain thingies on the door is great deterrent against maintenance guy’s keys, I’d think. All of which has nothing to do with Cheesecake-Filled Chocolate Cupcakes w/Coffee Cinnamon Frosting. Cheesecake is my friend, so anything that contains it or even references it is something that gets my full attention. These look terrific, and I’d certainly have one. Or two. 😉 Good stuff – thanks. These cupcakes look delicious and I love the mod decorating! Thank you–they were definitely jolly good fun to make! These look and sound so delicious that I am actually going to make them tonight! Thanks for the kind thoughts and invite to your link-up! I hope you love these cupcakes as much as my friends have; I’d love to hear how it goes. So I finally made them yesterday, and they were amazing! I think my husband won’t allow me to make any other cupcakes anymore! You did such a great job with this recipe!